Dr. Utriainen’s answer to the above is doubtless the primary reason. “Those who consider themselves or identify primarily as Lutheran—they don’t take other spirits as easily, but an angel is something they allow in their lives.” Despite its recent decline, Christianity is still predominant in most Western countries, and fairies, dragons, and Thor simply do not have a place in the symbolic and doctrinal systems that mediate most Western people’s spiritual experiences. To the extent that, as Stewart Guthrie has argued, perceptions of such agents is a “culturally universal” phenomenon, iconographies and traditions of angels are the only socially-affirmed cultural resource most Western people have for interpreting these natural experiences[i]. Whether in Judaism, Christianity, or Islam, however, angels have never been merely one-way messengers. In a general survey of religious attitudes and practices, such as the one from which Utriainen’s studies developed, the role of angel spirituality in mediating spiritual phenomena and esoteric practices to the Christian majority will surely be the most important facet. From the perspective of Pagan Studies, however, additional reasons for angelic pre-eminence in the West’s spiritual discourses become apparent. I have known Witches who would not touch anything they perceived to be “Christian” with a ten-foot pole, but who nonetheless freely invoked the archangels in the Lesser Banishing Ritual of the Pentagram. I have walked into metaphysical bookshops where Christian materials were strictly taboo, but Raphael and Gabriel could be found among the statuettes (the latter, interestingly, often depicted as female). These are big, brand-name angels, whose Hebrew etymologies and Biblical references could conceivably be troublesome; nameless generic angels, more readily assimilate to new contexts, saturate Pagan shops, homes, and Tumblr feeds, often keeping merry company with fairies and dragons (and, occasionally, even with Thor). 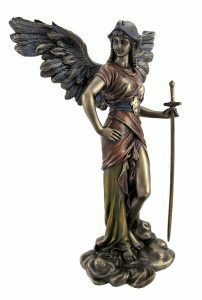 An angel figure by fantasy artist Anne Stokes entitled, ‘Harbinger’, being re-shared on a Pagan Pinterest as an image of the goddess Lilith. It is not simply, then, that angels provide the West’s only “orthodox” veneer for cross-culturally common folk beliefs and practices, such as many of the divination and healing rituals described by Utriainen. It is also that they stand virtually alone among the symbolic forms of Christianity in being largely acceptable in post-Christian spiritual circles. They have thus, true to their name, assumed a vital mediating role not only in moving ideas and practices from the esoteric, occult, New Age, and Pagan peripheries into the Christian “center”, but also in “reclaiming” aspects of popular and folk Christianity by modulating them out into Pagan, New Age, and other post-Christian communities. The reasons for this are several. The nineteenth century freely syncretized angelic iconography and Pagan subjects, bequeathing us visual traditions in which valkyries, for example, look very little like their textual descriptions in the Eddas. Pagan and New Age books and websites often go farther than simple syncretism, locating the origin of our contemporary ideas of angels themselves in pre-Christian and even pre-Judaic sources (such as Zoroastrianism), thus decontextualizing them from Christianity and shifting their discourse into a comparative framework familiar to, and comfortable for, Pagans and New Age participants. Though the former seek to build spiritual paths by reaching back to the memory of pre-Christian times, and the latter often attempt to transcend Christianity through the construction of a new dispensational discourse, neither group can wholly avoid grappling with centuries of Christian intellectual, cultural, and ritual heritage. Angels don’t just make esotericism accessible to Christians; they make the legacy of Christian thought and active dialogue with the Christian world accessible to people who have often left both on bad terms, and would not otherwise be willing or able to engage with them. As Christianity continues to decline in numbers and influence in the West, and a wide variety of post-Christian movements continue to expand, both directions of this exchange will be vital to fostering an atmosphere of authentic engagement and respectful dialogue in a spiritually pluralistic society. In some respects, as Utriainen observes, the appeal of angel devotions or of “angel spirituality” is quite specific. An overwhelming number of practitioners specifically identifying with these practices and traditions are women, and most hail from lower- to mid-middle class backgrounds. In other respects, however, the appeal of these practices and of the symbology attached to them cuts across some of the deepest divides of our contemporary religious landscape, linking the Christian majority to the post-Christian minority in a way that enriches both. What, exactly, the implicit transreligious theology behind these linkages will give rise to, or how it will impact the development of established religions and movements in the twenty-first century, is anyone’s guess, but when I see a young Witch make a real connection with her Christian grandmother over an image of St. Michael or a prayer to St. Raphael, I am able to believe, if not in angels, at least in the better angels of our nature[iii]. [i] We are, of course, not obliged to accept any particular theory, nor to take a position on whether the universality of such beliefs and experiences is indicative of a metaphysical reality behind them or simply of a common reflex of the human psyche, to recognize that such universality would demand a cultural vehicle for expression in the West. [iii] Though, for the record, I do believe in angels.